The Moving Bodies ball sports program assists students to develop, and fine tune, the skills and sporting techniques they will use for the rest of their lives. Our program covers all the manipulative skills required by the NSW syllabus and VIC AusVELS (e.g., rolling, stopping, throwing, catching, bouncing, striking & kicking). These skills are developed into game play situations such as small and major games, depending upon the age/stage of the students participating. We can tailor our program to accommodate your equipment and individual requirements. Students will learn how to apply different aspects of the skills safely. These activities act as lead up skills associated with the basics of all sports & everyday occurrences. Good sportsmanship is the ethos of our ball sports program. Our lessons outline and encourage teamwork, co-operation, competition and fair play. 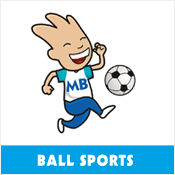 The Moving Bodies ball sports program helps develop the confidence that children need to achieve a lifetime of enjoyment through physical activity.